TRITON-TX Family Baseboard is a budget-priced production-ready baseboard. Together with a module from the pin-compatible TRITON-TX family, it becomes a complete ARM-based SBC, offering a range of processors – from a low-end ARM9, up to a quad core ARM Cortex-A9. 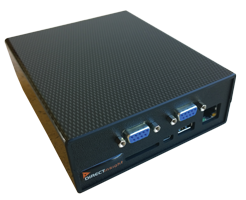 With our family of pin-compatible touch screen displays, TRITON-TXFB becomes the most versatile ARM-based SBC available today. Projects which can use an off-the-shelf board gain an advantage in cost and time-to-market compared with the creation of a custom baseboard. TRITON-TXFB can be used with any of the current generation of 3.3v I/O TRITON-TX modules, from an ultra-low-cost TRITON-TX28S or TRITON-TX6UL to a quad-core TRITON-TX6Q. Other supported modules include TRITON-TX25, TX28, TX48 and TX53. Powered from a single 5 – 30v supply, the Family Baseboard offers connectors for the most-used interfaces, and pin headers for much of the remaining connectivity specified in the standard TRITON-TX pinout. Downloadable Datasheet. For further downloadable documents click here. An ideal, certified gateway for IoT networks – works with Azure IoT Hub. Ideal for use as an IoT gateway, or “intelligent” edge device.